I was thinking that there are so many similarities to wedding ideas/favors and Christmas presents! 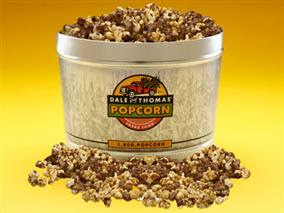 Last year when I was at The Special Event Conference in LA I met the people at Dale and Thomas Popcorn. I would love to do a popcorn station at an event (a twist on candy and sundae stations). But popcorn is also a great Christmas gift to send to someone that you won't see for the holidays. Samplers from $28-72 and a tin of popcorn for about $45. Flavors are so yummy! how about Peanut Butter and White Chocolate Drizzle corn or Cinnamon Creme Drizzle corn. For the holidays they are wrapping every tin in a canvas duck bag - holiday themed of course. Its also one of Oprah's favorite things! If you are interested in doing this for your wedding or next big part let me know!